It is time for yet another Earth Mantra release, this time Samhata, a collaboration between renowned ambient master Lucette Bourdin and Darrell Burgan, better known for his releases as Palancar. 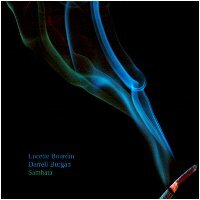 Sometime in winter 2009-2010, Lucette and Darrell started tossing around the idea of working together, to see what sort of music might emerge from such a collaboration. Living thousands of miles apart, face to face recording was impossible. So instead they embarked upon a freeform style of composition, where each artist recorded bits and pieces of solo material called doodles, which were then shared mutually, and remixed and reworked into whole new compositions. The result was a set of lovely pieces that often bear little resemblance to the individual doodles that went into them. Any time two or more artists work together to compose, there is an element of chemistry that must be present for the project to truly gel, otherwise the results may sound stilted or forced or otherwise incongruent. Finding this positive energy zone can sometimes be a challenging task for the artists in a collaboration, no matter how dedicated they are to making the collaboration work. Then there are those magical partnerships where the chemistry is instant, the music flows effortlessly, and the musical styles of the participants synergize almost magically. Such was the case for Lucette and Darrell on this particular project, an experience that both of them simply describe as "fun and fulfilling". The music they created is an interesting blend of their unique styles, a collection of light and misty ambient compositions that the artists feel make a truly special combination. Darrell and Lucette recorded so much material, in fact, that multiple albums worth of music was the result. Thus, Samhata is merely the first release of music from this productive and refreshing collaboration. Lucette and Darrell sincerely hope that everyone enjoys listening to this release as much as they enjoyed making it. And Earth Mantra could not be happier to be bringing the music of these two artists to its listeners, the first of what we hope to be many such releases in the future. Amazing stuff... I just can't stop listening to this album. Thank you! An absolutely perfect blend of two of my favourite artists. Beautiful! Nice - this is absolutely lovely and please don't make the mistake of thinking it's going to be simple. It's rich and beautiful but not trite. Very, very cool.